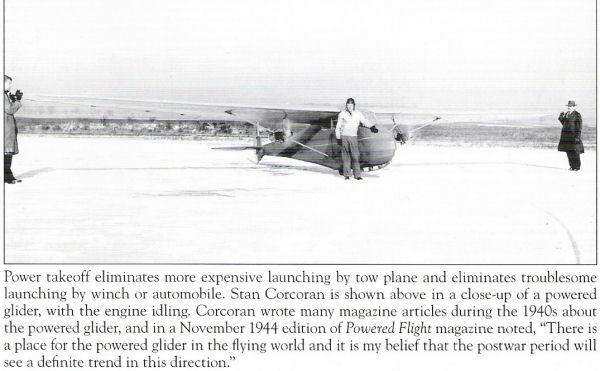 During the early days of American soaring movement, Stanley Corcoran became one of the noteworthy sailplane pioneers - both as a record setting pilot and as a designer/builder. 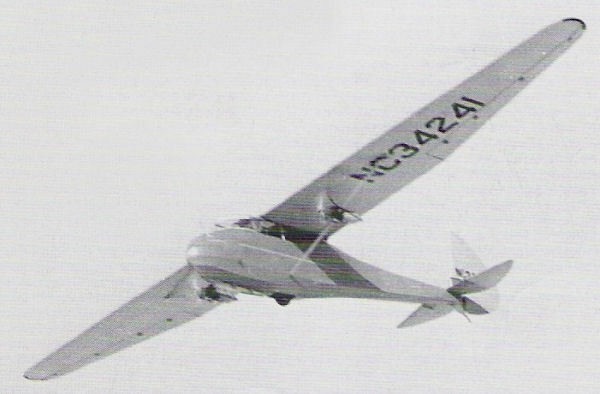 Having built the successful single-place Cinema I sailplanes, there was an obvious need for a two-place "high performance" trainer aircraft: the Cinema II was a natural outgrowth. 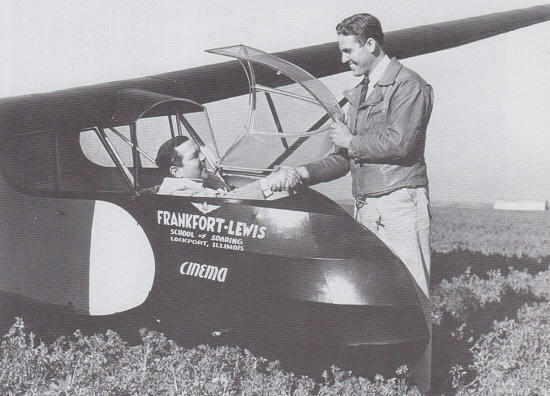 The original Frankfort Sailplane Company was organized in Frankfort, Michigan during 1939. 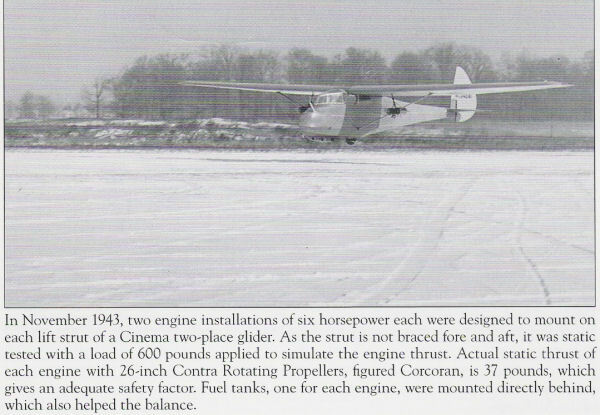 However, with World War 2 in Europe, and U.S. Army Air Corp’s interest in a glider program for possible Allied Forces participation, investors convinced Corcoran to move his company to new facilities in Joliet, Illinois, in 1940. Development work was continued on the Cinema II, finally resulting in Class 1 CAA approval. The aircraft construction was of typical design construction: metal tube welded truss airframe with wooden formers/stringers and fabric covering. The empennage was of very small horizontal and vertical stabilizers with associated large elevators and rudder of wood and fabric construction to form the "all-moving tail" group. 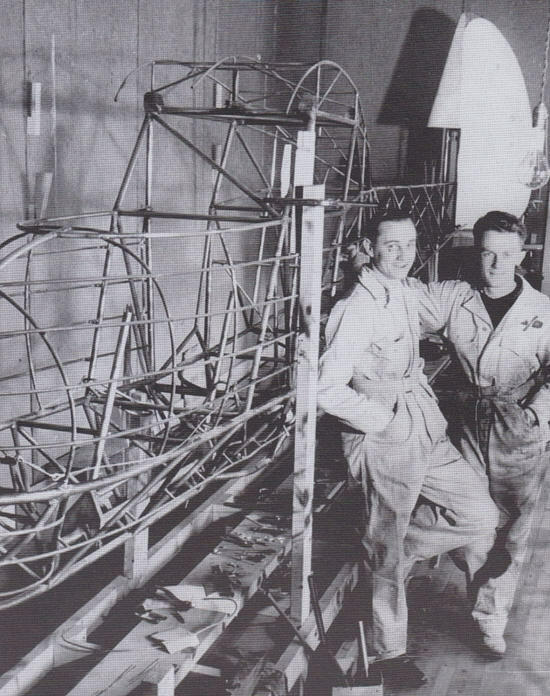 The wings were single strut braced, and constructed of wood with fabric covering. During this same time period, the nation was still recovering from the stock market collapse and its’ associated depression - many people were still without work. "When Franklin D. Roosevelt became president, he put his friend, Harry Hopkins, in charge of the Works Projects Administration (WPA). The purpose of the WPA was to give wages to people currently unemployed. By 1936 over 3.5 million people were employed on various WPA programs. This included the National Youth Administration (NYA). This program helped those who were between the ages of 16 and 25 who, because they wanted to continue with their education, were given part-time jobs. More than 700,000 students enrolled in this program. The high levels of unemployment meant that part-time jobs were not easy to find and most of the schemes were based in the cities and large towns." (www.spartacus.schoolnet.co.uk) It was this exact NYA program that Ted Bellak, a colleague of Stan Corcoran and former employee of Frankfort Sailplanes, had been appointed by Minnesota Governor Stassen, to organize and head-up the Minnesota State Gliding, Soaring, and Aeronautical Education Program under the auspices of the NYA. Selected schools throughout the state would provide students with vocational ground school classes in theory of flight, elementary aerodynamics, aircraft mechanics and construction, and related subjects. "During phase three of this program, two-place Frankfort Cinemas were to be constructed by NYA students... under the supervision of CAA licensed mechanics and inspectors. (Memoirs of Gliding and Soaring, T. Bellak) An order for three aircraft was placed with Stan Corcoran at Joliet, Illinois. 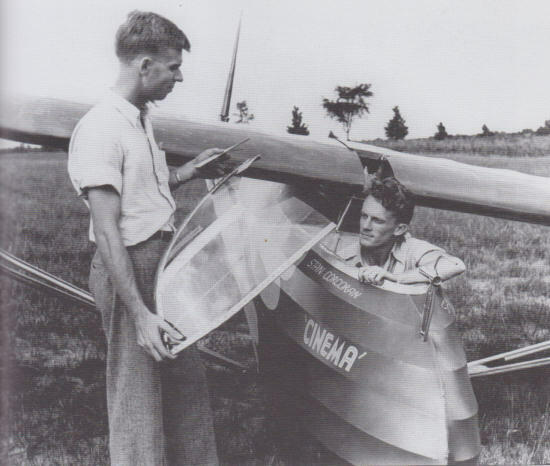 Upon completion of construction of the gliders, all participating students were given a flight in their glider. The program turned out to be a huge success, as many students continued their aviation endeavors in support of the war effort either in civil employment or the military. Two years ago, I purchased the first of the Minnesota Frankforts: NC24185, the "Northstar" ship. Although the aircraft had not flown in more than forty years, it was quite complete and in good condition. The restoration was straight forward, and returned to flight status this past summer. The aircraft looks as lovely as one expects of these beautiful old birds and a delight to fly. Hope to you all at one of the future regattas! Happy landings. Quelques documents historiques issus du livre "memoirs of gliding and soaring"
Aucun 3 vues du Cinema 2 étant disponible, j'ai dessiné ce triptyque en DAO en reprenant les grandes lignes du TG1A. C'est une véritable entraide internationale, les relevés de cotes ont été effectués sur le planeur par son propriètaire Dean Kramer en Pennsylvanie, puis Fred qui d'Irlande a joué le rôle de communication et traducteur avec Dean. C'est donc un travail d'équipe, je remercie toutes les personnes qui se sont impliquées dans la création de cette page, de Nouvelle-Zélande aux USA en passant par l'Europe. TG 1A - Frankfort Sailplane co. Par la suite, le Frankfort Cinema2 GliderB s'est décliné en une version militaire, le TG1A. La géométrie des empennages fût modifiée, les dimensions réduites de façon plus conventionnelle, ce qui donna plus de stabilité à grande vitesse au planeur. Des aérofreins furent ajoutés. Le pilote pouvait accroître la vitesse de chute du planeur jusqu'à environ 150 pieds par minute, à l'aide de ces AF.